Everywhere you look, people are on their smartphones -- but many aren't talking. They're browsing, texting and using apps, which makes them a tempting target for marketers. 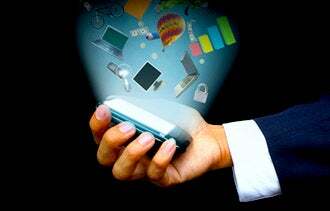 According to communication technologies agency the International Communication Union, there are now 5.9 billion users of smartphones and other mobile devices, representing 87 percent of the world's population. The ICU also reports that 1.5 billion people are using the mobile web. That's a huge business opportunity. But where do you start? Here is some insight on five mobile marketing questions every business owner wants answered. Most businesses will want to build or optimize their websites for mobile rather than build an application. Think of the fundamental reasons your customers would visit your website, especially if they're on the go. Make sure that on a phone or tablet screen your site's navigation is easy to use, there's no need for unnecessary zooming or scrolling, and the main things your audience wants are easy to locate. One of my favorite examples of a great mobile website is PapaJohns.com. There are three big buttons -- order a pizza for delivery, order a pizza for pick-up and find a location. If you want something else, go to the website on a computer, not a phone. Apps don't replace your mobile website. They supplement your audience's experience. Some businesses -- especially media outlets or those with a high volume of original content, such as blog posts or videos -- may be able to develop a useful service via an app. New York's Mermaid Oyster Bar includes its menu, locations, hours and a reservation link on its mobile-optimized website, along with a button to install its Oysterpedia application. The app is a companion encyclopedia of all things oyster, including photos and descriptions of the many varieties. It lets users bookmark their favorite oysters and share information with their social networks. The app is subtle. It doesn't directly ask people to visit the brick-and-mortar location, but it certainly establishes the restaurant as an authority. And where would you prefer to dine on oysters? Where the authority prepares them, of course. Responsive design is a relatively new approach to web design and development that essentially bakes in mobile optimization to your website rather than your having to create multiple site designs. Think of it as having one website rather than three -- one for the desktop browser, one for a tablet and one for a phone. Some content management systems and blog themes are emerging that incorporate responsive design. Also, many developers are building new websites with responsive design techniques in mind. So, responsive design can be had for minimal investment if you're using WordPress or a similar open-source content management system. QR, or quick response, codes are basically bar codes that serve as a link to send a phone's browser to a web address. Users scan the code with a QR code reader they have downloaded to their phones. You can use QR codes to deliver coupons, get customers to register for your email newsletter, or even send them to "Like" you on Facebook. But be sure to make the QR process simple and efficient. The web address you send people to should be optimized for mobile, and you should include instructions on using the code for newbies. Depending on your definition, we're already mobile-commerce ready with existing technology. Not only do mobile hardware accessories such as Square provide credit card readers that plug into your mobile devices, but platforms including Flint Mobile also remove the hardware requirement by using your phone's camera to scan the credit card number. But other products such as Google Wallet, which incorporate Near Field Communications -- a far more secure radio communication from a device like your phone to another device such as a cash register -- are still in limited testing phases. The carrier, device and operating system companies have yet to agree on industry standards for security and privacy protection. So you're not likely to see people waving cell phones in front of your credit card readers in the near future. Still, keep an eye on Google Wallet and other mobile commerce developments. We have answered some of the basic questions, but there's a lot more to know about mobile marketing before you dive in. Helpful online resources include Google's HowToGoMo.com and the site mobithinking.com, which includes many statistics and insights.